Sometimes called the Venice of the Alps, beautiful Annecy and its mountain surrounded lake is one of my favorite places to cycle (about 45 minutes from Geneva). It’s one of the most popular tourist sites in France. When friends visit us, we usually take them here. Sometimes, I will leave visitors to explore the historic sites and walk along the lake-front while I go off and cycle a mountain – and we then meet for lunch along side a quaint little canal. This is an updated version of an old post. 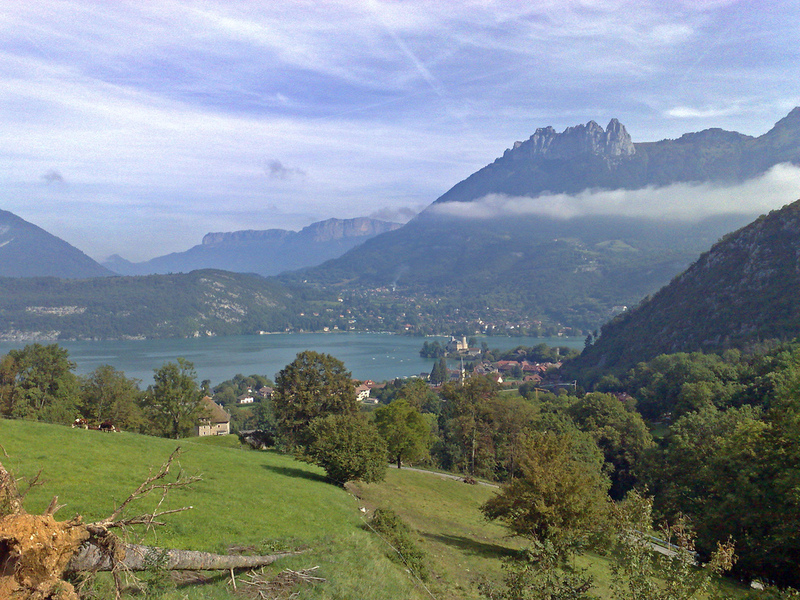 I receive a lot of emails re: cycling from Annecy. I am always happy to try and give any additional trip planning info. For cyclists that prefer flatter roads, there is a wonderful (flat) bike path that goes most of the way to Albertville along old railway lines. 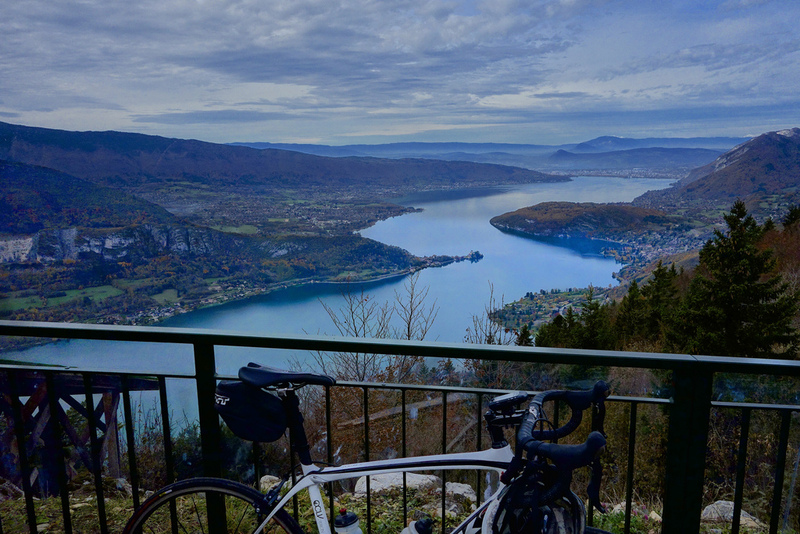 But I love Annecy for the many great and challenging cycling climbs in the area. Le Semnoz (summit also called Crêt de Chatillon) is the huge massive on the west side of the lake lake. 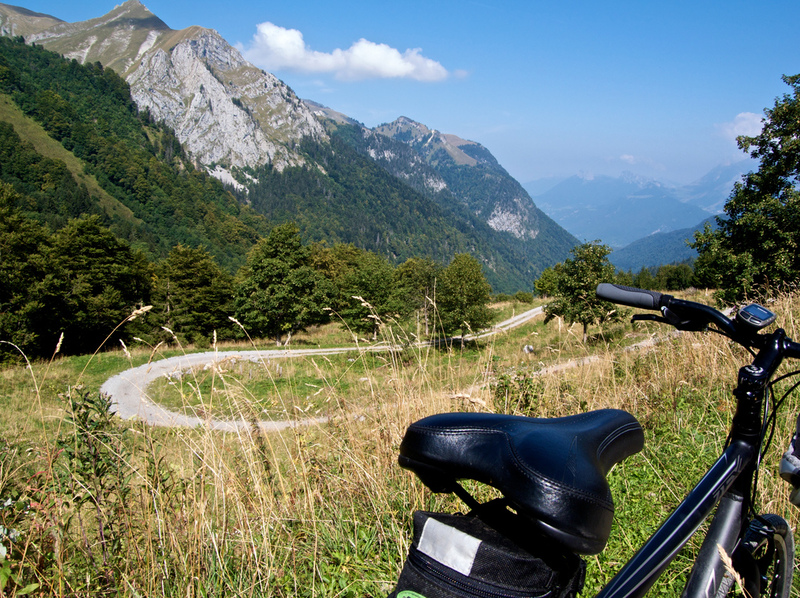 It is the highest cycling climb near Annecy. It has become a little better know after appearing in the 2013 Tour de France. The direct way through the woods is steep, but there are far longer more peaceful options too. The top is a small ski station. Details of all five routes. Cycling around the lake down low is a mistake. The road can be very busy, especially on weekends. Instead, take the bike path on the west side of the lake and then climb the steep and beautiful Col de la Forclaz de Montmin on the east side — and enjoy some fantastic lake views. This was the first place I ever saw a mountain stage in the Tour de France – the suffering! 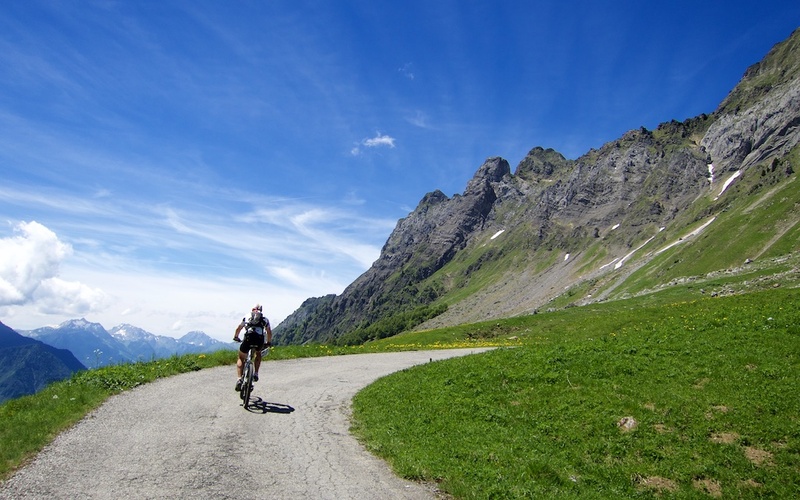 Above Col de la Forclaz is a great unpaved detour to Col de l’Aulp – see here. Here is a bigger ride that goes around the lake after first heading a little south to visit Col du Tamié and Col de l’Epine before climbing Col de la Forclaz. OK the first three are obvious. This may be a surprise. Not a well known climb. Most of this route is closed to cars and goes through a beautiful protected mountain valley. But to get to the top, you really need a hybrid or mountain bike as the route becomes a gravel road. Amazing ride. I have updated the link to a loop that includes descending the other side of Chérel and taking an interesting route back to Annecy. Really fun loop …. no road bikes remember. Details here. A long, lovely, but not too hard ride. 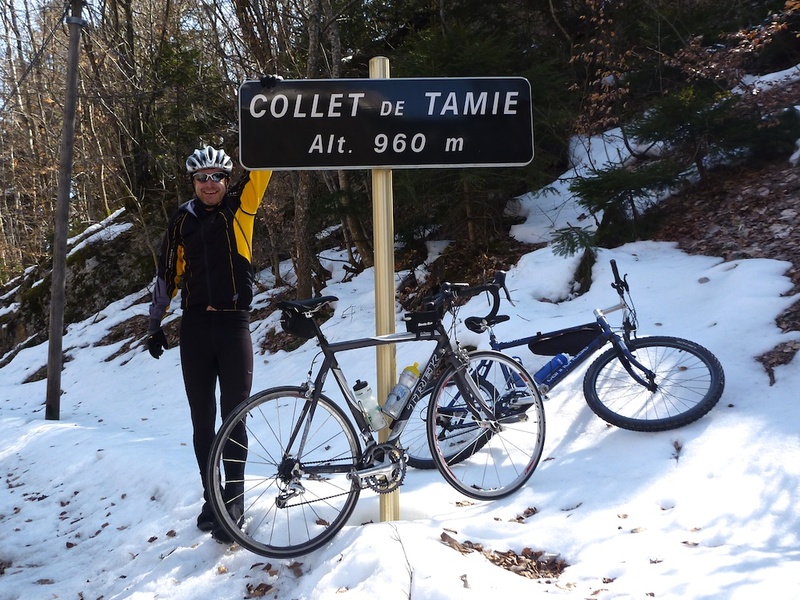 Head down the bike path to Albertville with a slight detour over Col du Voerger, then return via Col du Tamié. 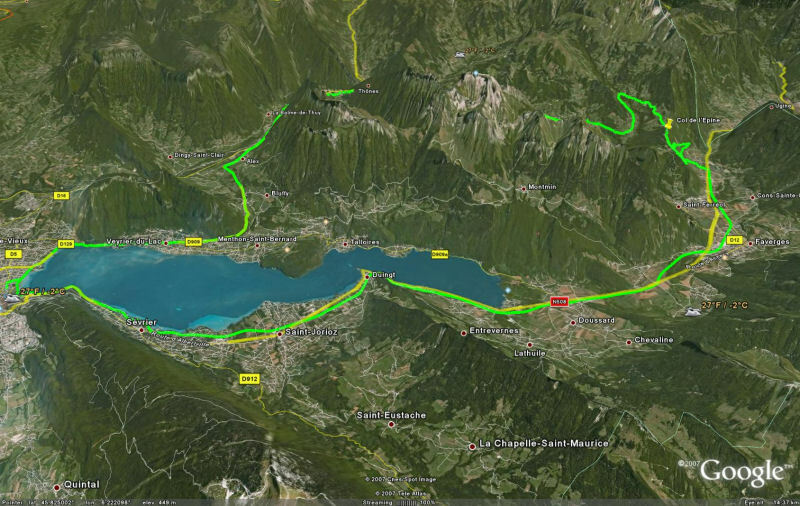 One could always make it a lake loop too, by adding Col de la Forclaz — see above. Some serious hairpins (42) on this challenging climb that starts well down the Annecy bike path towards Albertville, Ride Details. There is also an incredible traverse between Col des Aravis and Col de l’Arpettaz only possible on mountain bike. See here. Big Loop with Col de la Croix Fry, Col des Aravis, Col des Essérrieux, Col du Marais, and Gorges de l’Arly. 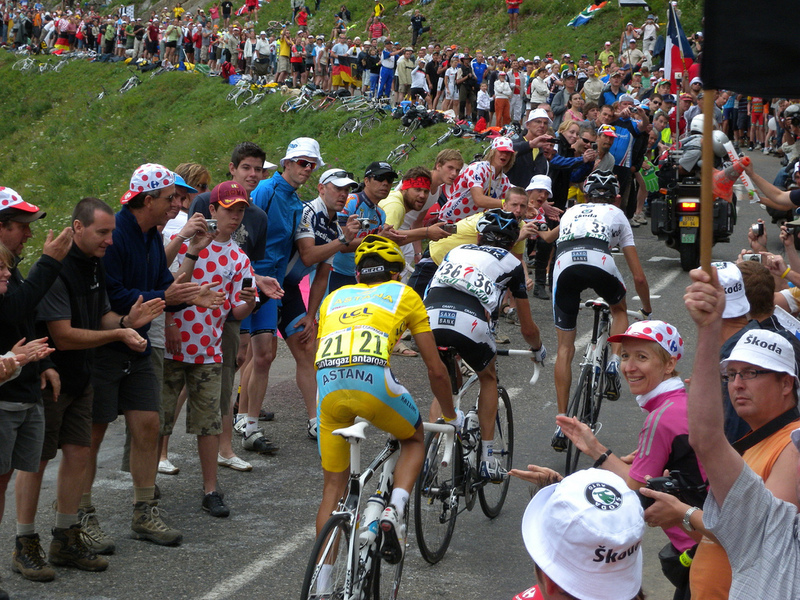 A fantastic loop that covers 3 small climbs and much of the start of stage 8 of the 2007 Tour de France. The route up to l’Epine in either direction is like a visit to a secret unknown valley. Smugglers Pass. This is a bit of a secret climb, unknown to most. It is certainly possible with a road bike but a pretty lousy surface – I would recommend a mountain bike. Doreen and I had intended to ride the cycle path, but the Annecy marathon was that day. So we went in the opposite direction and climbed. Surprise, up to the greatest cliff view overlooking the lake and town. At the Col sign, take the trail at the RIGHT by foot, and follow upwards for stunning views of the lake below ( a 15 minute hike). It’s a short ride to Le Grand Bornand and the start of the (easier) west side of Col de la Colombière. But it is probably the nearest “famous” Tour de France climb from Annecy. Details of all three sides here. Are you interested in cycling some alps climbs but a little intimidated or unsure if you can manage it? Col de Leschaux, near Annecy, is a fantastic introductory climb. 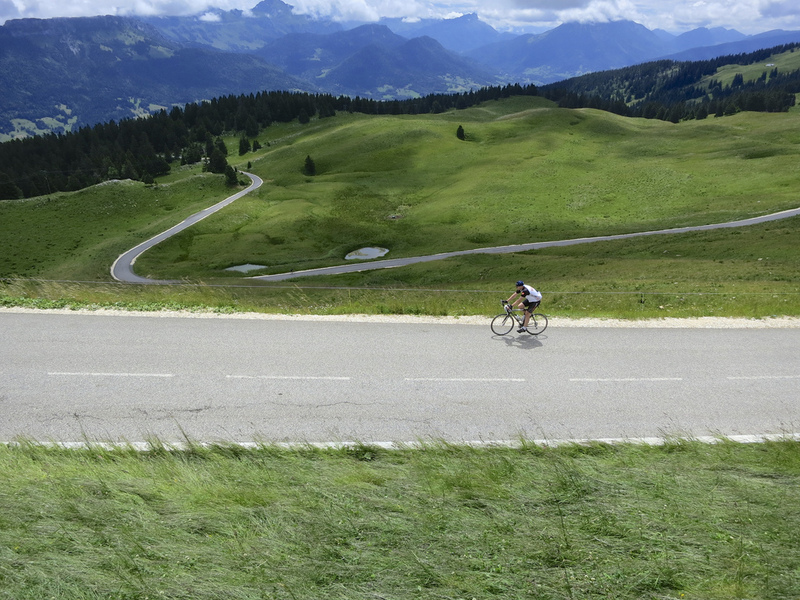 Note: you can continue higher from the col up to Le Semnoz if you feel strong – see #1 above. Or see here. 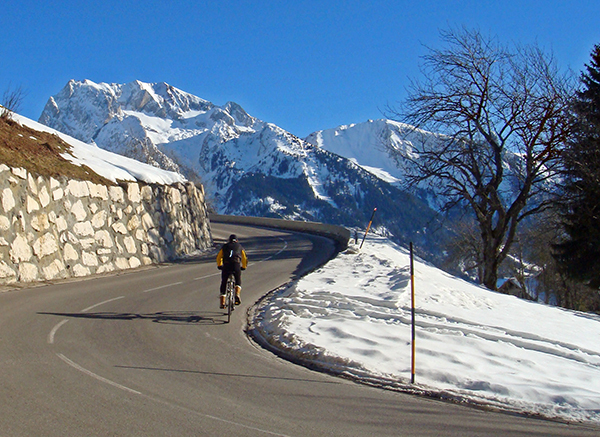 For the more adventurous, there are lots of other famous climbs within striking distance of Annecy. Scroll the map or see below for a few. Sprocketboy: hehe, yes Forclaz is no place for a recovery ride. Steep! Chateau Menthon on the east side of the lake in Menthon. Routes 2 and 4 goes very close to it – worth a detour. Donald: Thanks, This was a compilation of a few emails I have answered asking for ride info around Annecy – but I mainly wrote it to remind me to do these climbs in 2008. Slogfester: Martin refuses donut and coffee shops. Kebaps and beer only. We’ll fight it out Saturday. It’s a beautiful classification ! 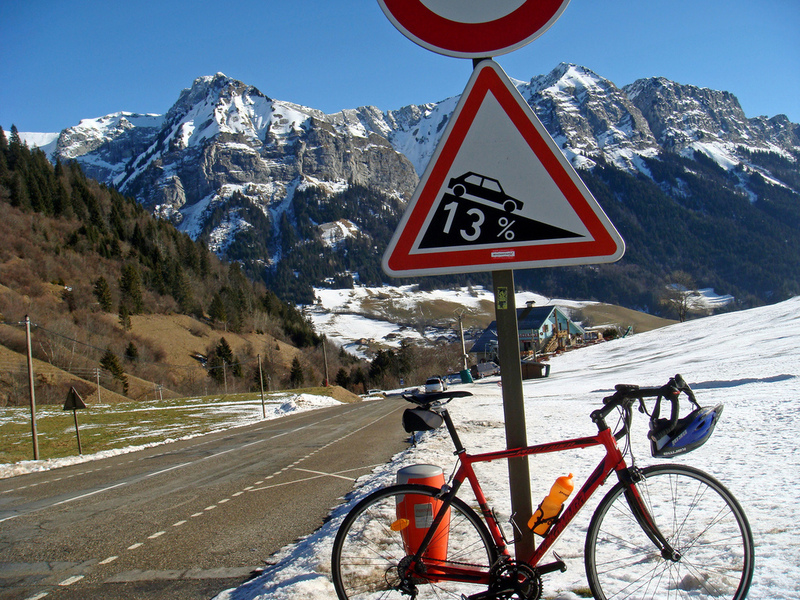 I know well Le Semnoz (very hard, bad day when I climbed it in April) and Col de la Forclaz. On the other hand, I don’t know the Col de Cherel. Maybe the next year ! I believe the South side of Cherel also requires a VTT (mountain bike) for the top half – there is not even a small road marked on the map. Will, excellent site. I’m just back from Annecy and I wished I had read your site more before I left. I did Le Semnoz ascending from Sevrier and then dropping down into Annecy. I was under the impression that the cycle path went around the lake but found it was only on the west side. Now seeing your site I wish I had carried on the cycle path and done the Col de la Forclaz – looks great. I can see your love for it – I’m just getting into road biking and it was a great feeling of achievement to reach the top under my own power. Good luck with the challenge! Great site. I climbed le Semnoz this April when there was still snow either side down to 1000m. The last 5km is steep and I wondered if it was every going to end. I also found a great little climb up through the village of Entrevernes towards Col de la Frasse. I didn’t get to the end as the road got icy. Great site. I am looking where to go in France this summer for family holiday where I can escape and ride some climbs. Your sight helped me choose Annecy ! Thanks for great information and expectations for cycling when I visit Annecy with my family in July. I would like to know is there a place to rent road bikes in the area? You will see lots of places to rent bicycles in Annecy ….. it seems like everyone rides. I have a small house in Talloires that I bought last year and will be spending May 15 to July 2 there. Excellent guides- thanks very much, Will. Just come back from a week by the lake – climbed Le Semnoz and Col de la Forclaz. Both exactly as described. Didn’t see another soul on Le Semnoz, but there were a few roadies on the way up to Col de la Forclaz. Even at this time of year it was chilly on the way down, so I was glad I had a windcheater in my back pocket. There are quite a few places in Annecy to rent bikes. I am glad the routes were helpful. Well done doing Semnoz and Forclaz …. both hard work. Thanks for the site! My wife and I climbed the Semnoz yesterday from Annecy. Lovely day blue to the moon sunshine. Toughest climb of my wife’s short cycling career!! She nearly cracked but we made it and boy what a view! The Mont Blanc was stunning, she started to cry! I have ridden lots in France but this is one of the best. Annecy would be a great starting point for awesome riding and your site was of great assistance in our choice to ride there! I go with my familie to this beautiful region. While other familie members like to swim and be lazy, i like to encounter the mountains by bike very much. Your routes and their description are very interesting. Can you please advise me where to rent a good and reliable mountainbike (i am an experienced biker) Thanks a lot. It depends where you stay …. it’s a fairly big region …. but I am sure you will have no problem finding a bike rental store …. there are quite a few. Worst case, the tourist info office has a list. I see you like climbing, yeah me too. Back in 2005 I had the pleasure of climbing some the roads in Annecy. What an awesome trip, I will never forget this time of my life. Well my reason for reaching out to you, I’m thinking about visiting France for the 2013 TDF. And, I was wondering if your still in France ? Hit me back soon. Just a quick note to say a HUGE THANKS for the website. I have just returned from a two week holiday with my wife and family in the Alps. We were based in a small village midway between Grenoble and Chambury. Thanks to your great website I was able to identify in advance of my vacation climbs nearby and also the more famous ones .THis was my first time cycling the big climbs in France and being Irish I did not know what to expect. With your website I was able to plan which climbs to attempt. Also it is great to see the chart for the climb which give a clear picture of the lenght of the climb, % gradient by KM etc. This helped to “prepare” me mentally for what aly ahead. Over the two weeks I was thus able to take on some great climbs – bothlocal and some famous – (Alpe D’Huez and Col du Grandon). Thanks again – I would have been at a loss to identify and find the climbs withou tthe website .Keep up the good work !! P.S. I’m not sure my wife passes on the same sentiment as your website ensured I was gone missing on my bike for a fair proportion of the holiday ……. I have updated the link for Cherel above. It now is a blog post that shows an amazing little loop down the far side of Cherel and then back over something called Col de Plane Joux (mainly unpaved) and back to Annecy over Col des Leschaux. I just want to say thanks for a great site and the work you put in. I´m in Saint Jorioz on camping at the moment, and your site has been very helpful in finding routes i can do while here. Going to Switzerland – Interlaken next week and have used your site for inspiration as well. Thank you very much. My homework is done thanks to your detailed posts! Col de l’Arpettaz is great. Only three cars passed during the whole climb. Great for honing descending skills – 40 odd turns to practice on. I’m starting to prefer the less trafficked climbs likes this one over the more famous and busy cols. There is a very useful bike hire shop in Sevrier, about 5 km out of Annecy. I found it earlier this year and I’d recommend it if needing to hire a bike in Annecy. It’s in the centre of the village. It’s possible to park nearby (try that in Annecy). I think there is a bus from Annecy if you don’t have a car.. We just hired town bikes to go on the bike path and they were fine. There are road bikes too but I cant say if they are good or not. The owner is South African and bilingual. just to inform that you can rent a very good road bike carbon in Geneva and Annecy from the company BCYCLET. We are 10 guys who wants to spend 3-4 days in the annecy area. Can anyone recommend a good hotel where it is possible to get our bikes locked in at night? We are driving roadbikes and prefers to be able to leave the cars behind and drive bikes from the hotel to different routes. 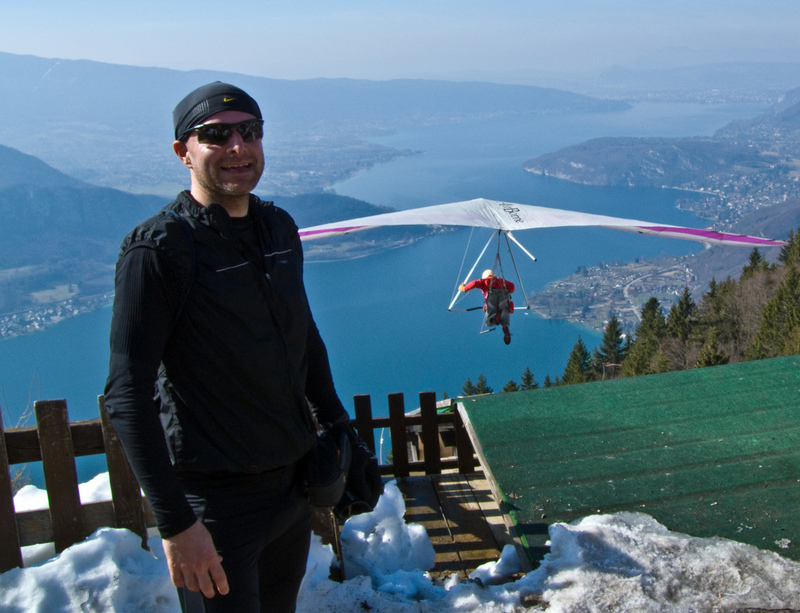 Henrik – Were you able to find good accomodations in Annecy? 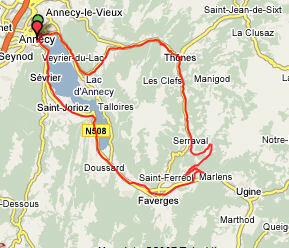 We are a group of 3 road bikers who are not sure of the best area to stay in or near Annecy in July. What have you found. This is a late reply to the posts above about accommodation, but someone else may find it useful. We found Annecy very bike friendly. We stayed at the Hotel Ibis Annecy Centre Ville (great location in the historical centre, great breakfast too!). We had no problems bringing our road bikes into our room. Piece of mind when travelling with expensive road bikes. thanks for these great routes, untill what time in the season can you ride most of those colls? i’m thinking about spending 1 or 2 months at the lake in september/oktober to go swimming an cycling..
None of these climbs are too high weather-wise. Generally, they are quite rideable Well into November. But of course no guarantees. Enjoy. Hi Will – great website and photography. We are going to be staying in Doussard in august and I am hoping to get some time off for a half day or full day ride. – can you recommend anywhere nearby that I could rent a decent quality bike – preferably MTB or CX / gravel type? Sorry, I don’t know anyone there. BUT it shouldn’t be too difficult to find quite a few rental places nearby. Certainly towards Annecy there are rental places along the bike path that ride by Doussard. Beautiful pictures! Are there any group rides or cyclists you know in Annecy that would be willing to let a solo rider join in? There may well be, but sorry, I don’t know any.